This studio is about design in existing buildings. It is about a layered experience of heritage architecture and an engaged approach to place. We see design as a negotiating a place from a complex mix of social, political, economic and material flows between different cultures, selves and communities – design is agency in time, participating across years, days and hours. Specifically, this project challenges us to reinterpret social and aesthetic values in a regional city and activate a fabric of religious education buildings to reflect our own times and positively-different cultural values in architecture. This studio is also about placemaking in the context of ethnic cultural difference. Today, migrants, new and old, negotiate complex definitions of diversity, identity, and independence, with each other and the existing environment. And to this, we know designing a building to accommodate the needs and practices of different ethnic groups is especially challenging, because it also engages the participation and implicit values of the designers themselves. Beware! Conflicts are rife. This studio is the second in a series of successful studios, and is a funded pilot for the Myer Foundation – Placemaking Sandbox research project. It brings together diverse ethnic community groups around the Ballarat Regional Multicultural Hub – Welcome Centre. This studio will provide students with an introduction to designing for ethnic cultural differences, and the tools to better understand their own role, who they are designing for and how to test their own assumptions during the design process in place. We will do this through teaching a designed, creative placemaking process, layer upon layer. The site includes 2-3 storey heritage buildings built between 1881-1960s, that make up the former Sacred Heart Convent, in Victoria Street, Ballarat. 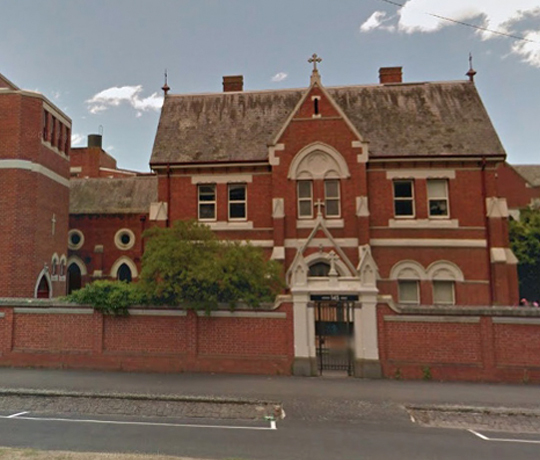 This site was the former Sisters of Mercy convent, in the heart of a Catholic education precinct and has in recent years been home to ghost tours, photo exhibitions, dance classes, and now the Ballarat Regional Multicultural Hub. Importantly, the site sits at the entrance to (rapidly growing) Ballarat, from Melbourne. We see the possibility of modelling a new form of public interaction space. We will be interrogating the everyday concepts of heritage and place through both material and social means. To do this, the main themes we will introduce will be 1. Self and Community; 2. Assets and Environment; and 3. Strategic Design. More generally we will be developing architectural forms and processes that explore different languages and modes of occupation, refuge, expression and sharing through rhythms of 1. partitions, 2. paths, 3. participation and 4. program. Running parallel with real masterplanning and early works projects on the site we will carry out precedent research and design exercises that may actually be implemented. We will aim to build systems for an urban ecology. Our studio will synthesise and construct complexity through a processes of layering, followed by an on-site intensive 16-19 March 2018. To practice and research participatory design, we will have the chance to interact with real client-organisations that interact with the site, and through practicing participatory design, will develop a sense of real sustainability and here. Students will construct models of their detailed design that together with other students in a grand scheme for the heritage precinct. The outcome will be design as both ‘thing’ and ‘process’. This studio is an excellent opportunity to learn about community engagement in placemaking, heritage architecture and masterplanning. AMMON BEYERLE ARBV 19197, M.Arch, B.PD (Architecture), D.ML (German), The University of Melbourne + PhD, The University of Melbourne, in progress Ammon is a passionate and driven architect, researcher, writer and teacher. He lives in Ballarat. In 2009 he developed Urban Village Melbourne, a multidisciplinary social enterprise interested in arts, design, research, community development and sustainability in public space. Working for five years between France, Germany, Japan and Australia he brings experience in the management of public architectural and structural design projects to here studio. He is currently undertaking a PhD regarding participatory architectural practice in local urban ecologies. PHILLIPA HALL B.Sc, M.Arch, P.G.Dip., Welsh School of Architecture, Cardiff University Phillipa is a UK qualified architect with experience of integrating new construction into listed and historic structures. Her work at varied practices in the UK furthered her knowledge, working on projects of different scales in the residential and public sectors. She enjoys design which responds to, and enhances, the existing situation, while considering the long term future of the building - socially, physically and environmentally. Guattari, Félix. The Three Ecologies. Athlone Contemporary European Thinkers. London: Athlone Press, 2000 (1989). 1989. Deutsche, Rosalyn. Evictions: Art and Spatial Politics. Graham Foundation/Mit Press Series in Contemporary Architectural Discourse. Chicago, Ill. Cambridge, Mass. : Graham Foundation for Advanced Studies in the Fine Arts/MIT Press, 1996. Miessen, Markus, and Shumon Basar. Did Someone Say Participate? : An Atlas of Spatial Practice: A Report from the Front Lines of Cultural Activism Looks at Spatial Practitioners Who Actively Trespass into Neighbouring or Alien Fields of Knowledge. Cambridge, Mass. : MIT Press, 2006. Miessen, Markus, and Chantal Mouffe. "Violating Consensus: Markus Miessen Interviews Chantal Mouffe." In Verb Crisis, edited by Mario Ballesteros, 168-80. Barcelona: ACTAR, 2008. Nancy, Jean-Luc. "The Inoperative Community." In Participation, edited by Claire Bishop. Documents of Contemporary Art, 54-70. London: Whitechapel Gallery and MIT Press, 2006 (1986).